OTR is very excited to bring the first of a series of UTR (Universal Tennis Rating) events to Hong Kong, giving tennis players in Hong Kong and Asia a chance to be a part of a global tennis rating system that is taking the world by storm. Universal Tennis Rating (UTR) is a global tennis player rating system that produces an objective, consistent and accurate index of players’ skills. The UTR database already includes results from more than 8 million matches and 200+ countries and it’s growing daily. UTR is a number between 1-16.5 that you’re allocated based on your match results. Three factors go into the rating: Competition, Score and Recent History. UTR Powered by Oracle is a modified elo rating system that promotes fair and competitive play across the tennis world. Players are rated based on actual results, not age, gender, nationality, or socioeconomic status. When you understand your skill level, you can find hits, events, and tournaments where you’ll have fun, play competitive tennis, and improve your game. All you need to know is your UTR! UTR (Universal Tennis Rating) is a number that provides a real and accurate measurement of skill level. A player’s UTR is a number between 1.00 and 16.50. One match result is all it takes to receive a projected UTR. After approximately five matches, the rating becomes official. As matches are played and entered into the system, a player’s UTR will increase or decrease over time as per the following methodology. For each match, the algorithm calculates a match rating and a match weight for each player. A player’s UTR is the weighted average of up to 30 of his/her most recent match ratings. Only matches within the last 12 months count toward a player’s UTR. Two metrics are used to calculate match rating. The first metric is the UTR difference between opponents. The second metric is the competitiveness of the match, as determined by the percent of total games won. Given the UTR difference, the algorithm expects a certain percent of total games won. The player who performs better than the algorithm’s expectation will see their match rating go up while the other player’s match rating will go down. When one player’s match rating increases, the other player’s match rating decreases by the same amount. Format – As the match format increases in length, more weight is given. A match with a three-set format receives more weight than a match with an eight-game pro set format. Competitiveness – As the UTR difference between players increases, less weight is given. For example, imagine a player with a UTR of 6.00. A match played against an opponent with a UTR of 5.00 or 7.00 receives more weight than a match played against an opponent with a UTR of 4.00 or 8.00. Reliability – As the reliability of the opponent’s UTR increases, more weight is given. A match played against an opponent who competes often and thus has a reliable UTR receives more weight. Time Degradation – As prior matches get older, less weight is given. Since the algorithm is a representation of current form, it gives more credit to matches played within the last few months. I won my most recent match. What will happen to my UTR? The algorithm focuses on percent of games won. If a player wins a higher percent of games than the algorithm’s expectation, their match rating goes up. Likewise, if a player wins a lower percent of games than expected, their match rating goes down. Factors other than your most recent match also impact changes in UTR (see next question). What factors determine whether my UTR goes up or down? The biggest factor that determines a UTR increase or decrease is a new match being added to a player’s record. However, this is not the only factor. Your oldest match falling off (because it became older than 12 months or was bumped off when a new match was added) can also have an impact. Another factor is time degradation. As prior matches move down the list, they receive less weight, so the weighted average of match ratings and match weights can change. Is it possible for my UTR to go up or down, even though I haven’t played a new match? Yes. Since the algorithm is a dynamic system that recalibrates every night, there may be small fluctuations in UTR. This is more common for players who recently joined the system. As more matches are added to a player’s record, their UTR becomes more stable. There are also small fluctuations in the match weights of a player’s existing matches that can affect the rating even while not playing. For example, time degradation will slowly decrease the weights of existing matches. For matches with a large UTR difference, can the higher-rated player still increase their UTR? Yes. If the higher-rated player performs better than the algorithm’s expectation, his/her match rating goes up. Do some matches not count towards my UTR? The algorithm excludes matches in which a) a player withdraws before the match starts, b) the match starts but neither player wins at least four games (due to a withdrawal/retirement), or c) there is a UTR difference of more than 2.50 and the higher-rated player wins as expected. These excluded matches still show up on the player profile but are not used in the rating calculation. Why does the algorithm exclude matches with a UTR difference of more than 2.50? 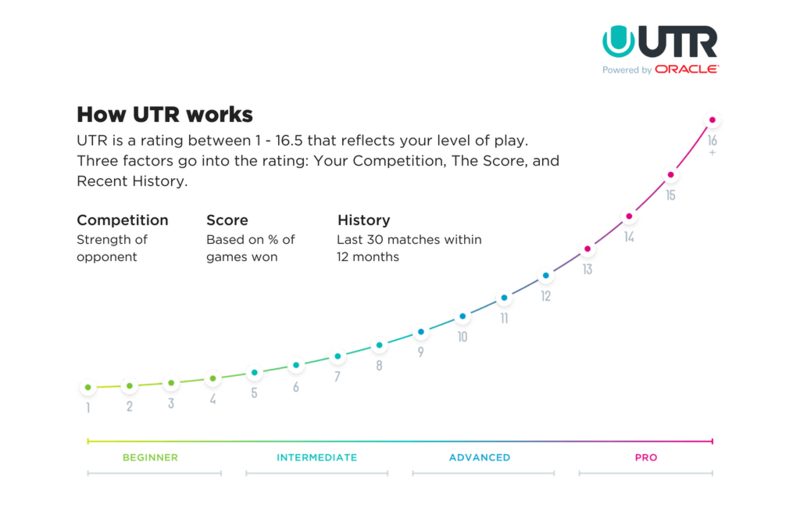 As the difference in UTR increases, so does the likelihood the higher-rated player wins the match easily. Our data indicates matches with a UTR difference of more than 2.50 are almost certain to be a blowout. Results like these are not indicative of either player’s skill level and are excluded by the algorithm. That’s perfectly fine. If you have played only 10 matches within the last 12 months, the algorithm will use those 10. 30 is simply the maximum. If you have played 40 matches within the last 12 months, the algorithm will use the 30 most recent matches. Why does my player profile show more than 30 total matches? Many profiles show a longer match history, but only the most recent matches (those with a UTR ball icon next to the score) are used in the calculation of your rating. Matches without an icon are either a) too old, b) a withdrawal, or c) outside the 2.50 cutoff for UTR difference. Absolutely. One match is all it takes to get a “projected” rating. After approximately five matches, your rating becomes reliable. A projected rating is shown as a (P) on the player profile. What is a projected rating? How many matches does it take to go from a projected to a reliable rating? The algorithm needs approximately five results before it can calculate a reliable UTR. Ratings based on fewer than five results are not yet fully reliable, so are considered “projected”. A projected rating is shown as a (P) on the player profile. The singles and doubles algorithms are very similar. For doubles, the algorithm compares the average UTR of Team A to the average UTR of Team B. Given the UTR difference between those two averages, the algorithm expects a certain percent of games won. The team who performs better than the algorithm’s expectation will see their match rating go up. Both teammates see an increase or decrease by the same amount. How quickly does UTR update my recent results? The algorithm updates once every 24 hours. As soon as a match result is posted and gets imported into a player’s profile, the result will be reflected in the next day’s UTR. Some results take a few days or more to be posted by the tournament director. No. To preserve the distribution of player ratings by skill level, the algorithm has upper and lower bounds for UTR. THE FIRST UTR TOURNAMENT IN HONG KONG! To ensure your place, please contact Coach Jason at Jason@otrtennis.com .